Yad Chessed supports Jewish individuals and families by alleviating economic distress and helping them reach financial stability. On Purim, Yad Chessed works with 65 synagogues, colleges and day schools across Massachusetts to collect AND give away matanot l’evyonim (gifts to the poor) to Jewish families in need. Last Purim, Yad Chessed distributed $143,500 in food vouchers to more than 700 local families. The special mitzvah of matanot l’evyonim requires Jewish people of all ages to give over and above customary tzedakah to at least two people in need on Purim. It also instructs Jews to give to anyone who asks, without evaluating that person’s level of need. Join Yad Chessed in breathing new life into this ancient mitzvah. Help us offer a hand of loving kindness by making an online donation. Yad Chessed has developed a unique community-wide program in support of this custom, helping to both identify Jewish people in need and ensure that your donation reaches them on Purim. Funds are collected at Megillah readings on Erev Purim, or Purim morning at participating congregations, minyans or day schools. If you can’t attend a service, but would like to donate for Purim, you’ll be able to make a donation online. Yad Chessed gives out vouchers (with no dollar amount) to needy families in advance of Purim. These vouchers can only be used starting at 1 PM on Purim day. After Yad Chessed determines the total amount collected, Yad Chessed calls the participating stores and tells them how much each voucher is worth. 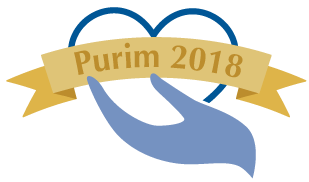 At Purim, help us offer a hand of loving kindness to more families on Purim by making a donation at your synagogue, college or day school or online today. For more information or if you have questions, please contact Yad Chessed at (781) 487-2693 or info@yadchessed.org. March 2018: Meet our New Executive Director! We are thrilled to introduce our new Executive Director, Meggan Levene! And the entire Yad Chessed community again offers thanks to our outgoing Executive Director, Suzi Schuller, for her passionate leadership and dedication over the past three years. Read more in this letter from our Board Chair. from Yad Chessed by email! featured in the Shalom Magazine: "Are We Doing Enough to Help Our Jewish Community?" Find us on social media: Facebook and Twitter! © 2019 Yad Chessed. All Rights Reserved. Yad Chessed is a registered non-profit organization with 501(c)(3) status. All donations are tax deductible.